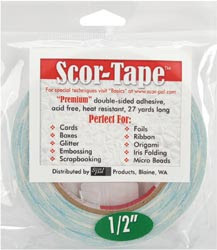 Scor-Tape is an amazing product. It is a premium double sided adhesive, best on the market, acid free, heat resistant and incredibly sticky tape. It can be used with embossing powders, foils, beads, glitter, ribbon etc. It is the perfect permanent adhesive for card making, boxes, books and Iris Folding. I have it available in sizes 1/8", 1/4", 1/2". I used to use the Red tape and get frustrated every time I tried to use it. I have no trouble peeling the paper from this tape and you can tear it instead of having to cut it. It is a product I use all the time. Please e-mail or call me at 574 656 3663 me if you would like to purchase the tape. Be sure to tell me which sizes you want to purchase and your mailing address.